You’ve heard of the phrase, “it’s not what you know, it’s who you know” about how to get on in life. It’s a principle that Velocity encourages for business too, having recently used its contacts to introduce two local businesses to each other to open new opportunities for them both. Velocity business adviser Emmanuelle Clément takes up the story. It has been a magnificent Tour de France for British cyclists with Chris Froome being the first to win the Tour on three occasions and 23-year-old Adam Yates taking the white jersey for best young rider. Stony Stratford-based cycling business Twenty3c must be proud of this as they love everything about bikes, building them, selling them, fixing them and more importantly riding them. Established in 2008, the team ensures that every bike they sell is not only the right size but is also set up correctly to help cyclists get the most out of their cycling experience. They also offer a full workshop service so if customers need help with fixing something or want to know how something works, Twenty3c can help. In October 2013 the company moved from its original premises onto the High Street in Stony Stratford, in which it has also opened a coffee shop. 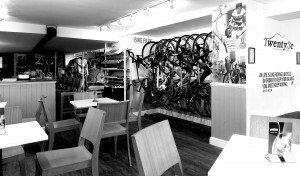 Customers can ride over to their bike shop and have a coffee. Local businesses also use the coffee shop and when Ian Swanston from Nutshell Creative dropped in one day at Emmanuelle’s suggestion, he got into a conversation with the owner, Ceri Dipple, and quickly discovered a strong company ethos for “providing a genuine local bike shop experience, building great relationships, and leaving a lasting impression, something that the internet can never offer”. Nutshell applied its cross media technology approach for Twenty3c and planned an engaging campaign that added value to an already excellent service. They developed a series of loyalty initiatives that offer rewards for the buyer (loyalty scheme, early bird offers, discounts, maintenance plans, bike fitting and accessory packages) and a branded registration portal that allows users to sign up. The member price was also displayed on equipment in store; tablets, flyers and loyalty cards were available, encouraging membership take-up. This gathered the data that Ceri needed and more as personalised electronic marketing campaigns, a quarterly newsletter, vouchers and other contact points followed. Twenty3c now provides a high value, personalised service and has a very active community. Emmanuelle said, “Having introduced the two businesses to each other, Velocity is now helping Twenty3c to identify contacts in team-building companies that offer cycling activities. It’s a chance for them to wear the yellow jersey in a whole new market. It is a great example of two local businesses that are passionate about adding value working together to create a thriving, local community”. To find out how Velocity can help your business, call us now on 0300 01234 35.